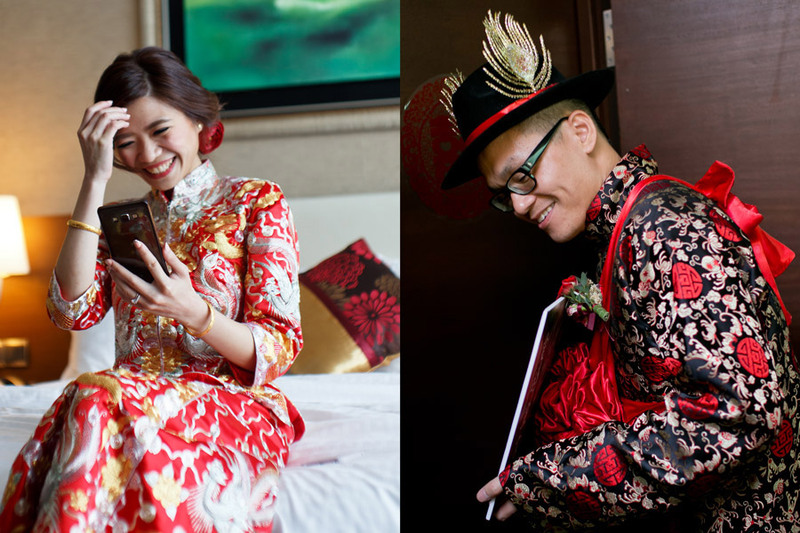 Kee and Mei are resplendent in their traditional Chinese wedding attire. 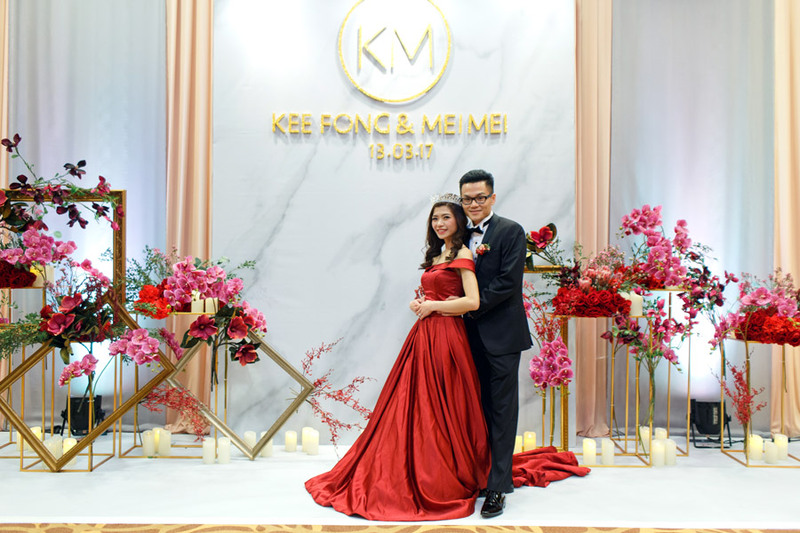 Looking through these photos captured by Mocco had us reminiscing about Kee and Mei’s gorgeous and fun-filled wedding held in Butterworth, Penang. Our couple called it “whimsical luxe”, which we felt suited their style and personality perfectly, and it was taken to the next level with the expertise of their wedding planner Tricia from Moments. Let’s take a look at these photos that so beautifully captured the mood and atmosphere of their big day! The groom and his best men in their “chang pao” look very dapper for the gate-crashing ceremony. 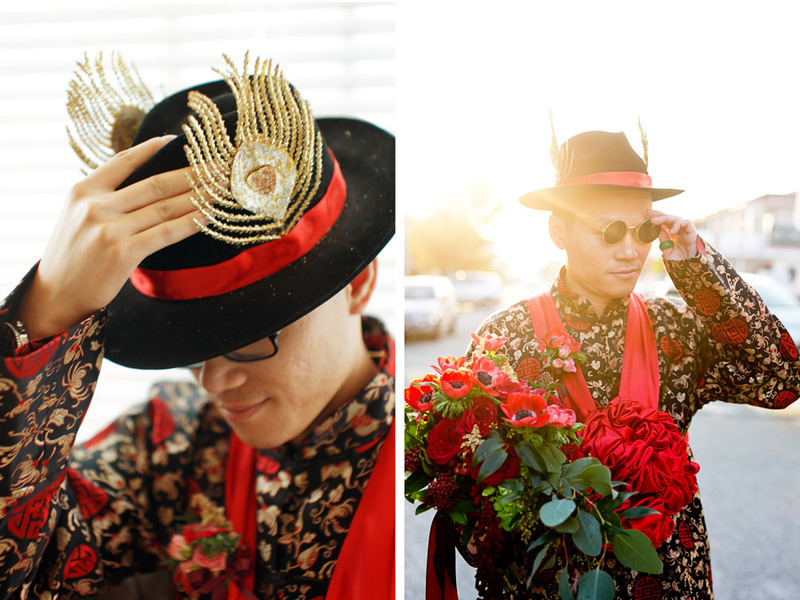 The groom is unmistakably stylish in his traditional wedding “magua”. Left: The beautiful bride in her traditional “kua”, watches the gate-crashing activities on her phone. Right: The groom survives the games and goes to claim his bride. Our couple with the bridesmaids, who are wearing a more modern two-piece outfit. 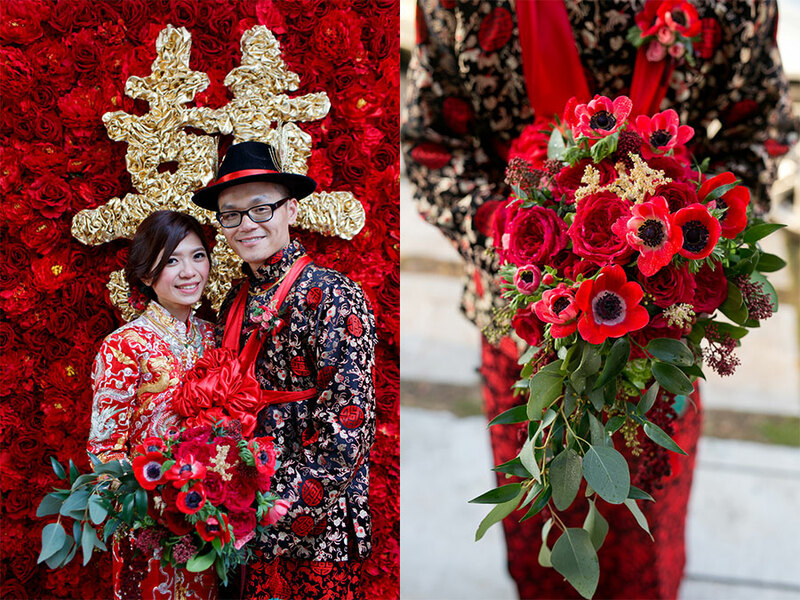 As you can see, our fun-loving couple went the whole nine yards with the traditional Chinese wedding attire! We love that they not only chose theme-appropriate clothes for themselves, but also for their wedding party. Kudos to all of them who went along with this grand idea. Red with a hint of gold was the definitely the colour of the day for Kee and Mei. 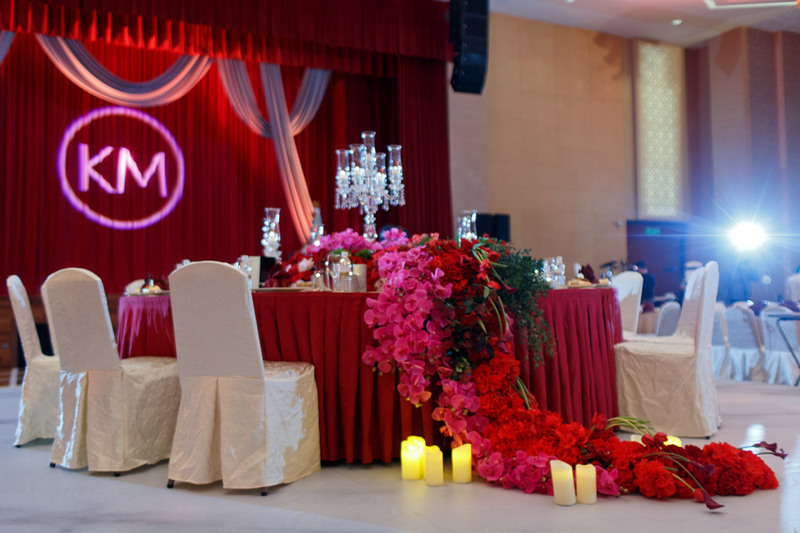 “We chose the colour palette of red marsala and maroon with a hint of gold, knowing this would definitely please our parents,” Mei explains. 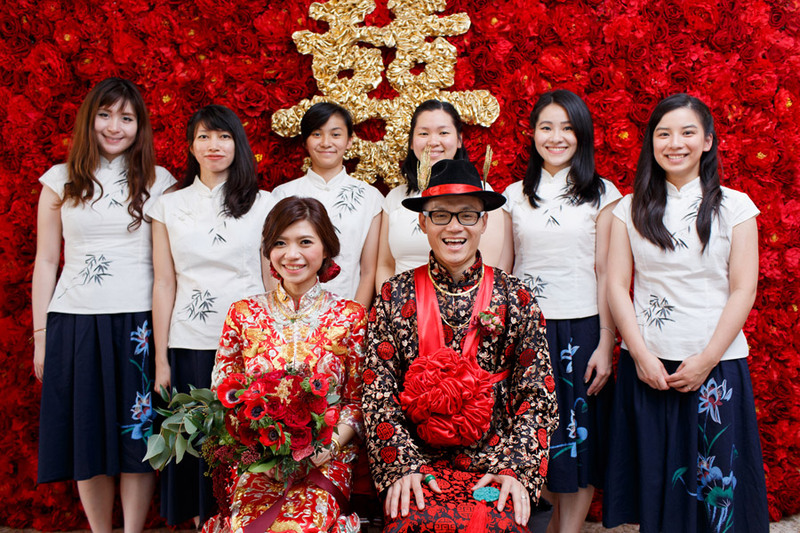 “But we didn’t want it to be yet another Oriental-red-themed wedding.” Our bride has always wanted a whimsical element in her wedding, so having everyone in the bridal party dressed in traditional attire was most theme-appropriate and fun. 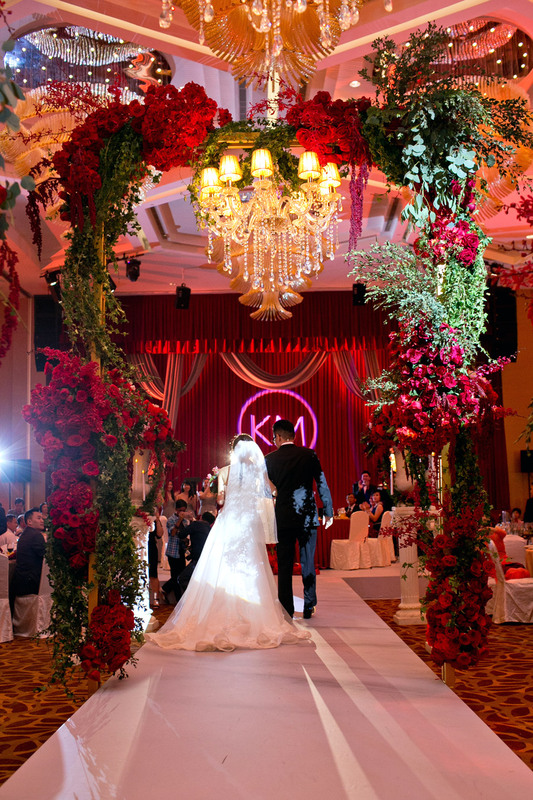 “Living abroad made wedding planning a bit more challenging,” Mei shares. “We pretty much sourced most of the clothing and accessories online. 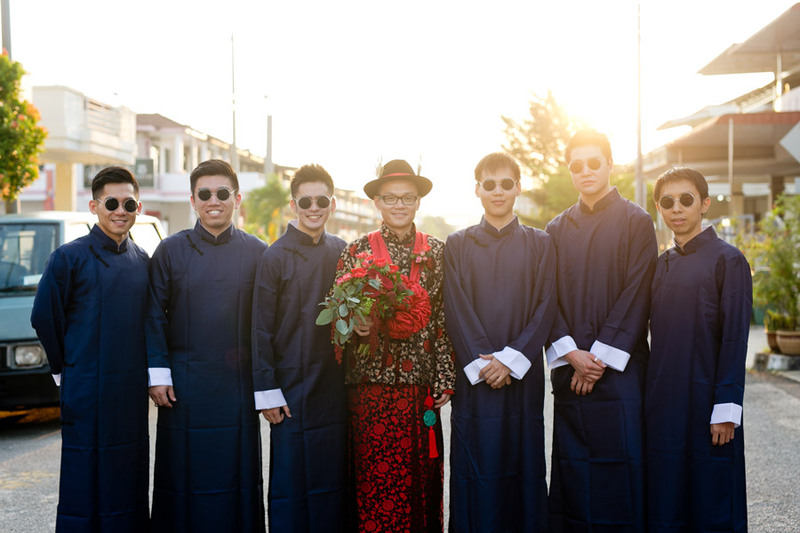 We found our vendors through Facebook, and were extremely satisfied with them.” While the bride’s dresses and groom’s suits were tailor-made in Malaysia by Wedding Isle Gallery and Vincent Tailor, the bridesmaids’ dresses were from an online store called Parsealed, and the groomsmen’s changpao were ordered from Taobao. 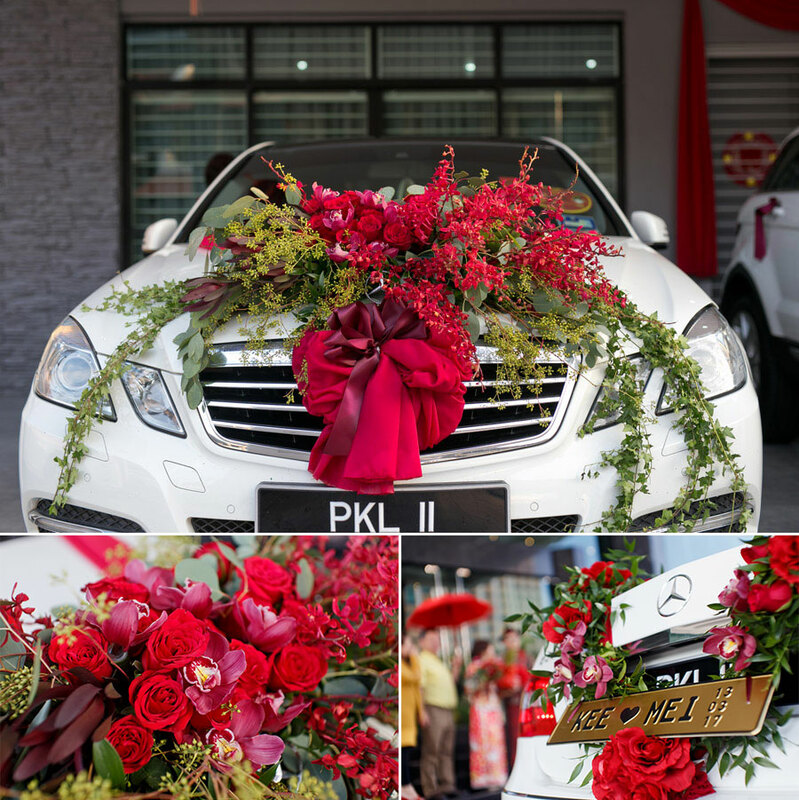 The wedding “carriage” decked in bountiful blooms. 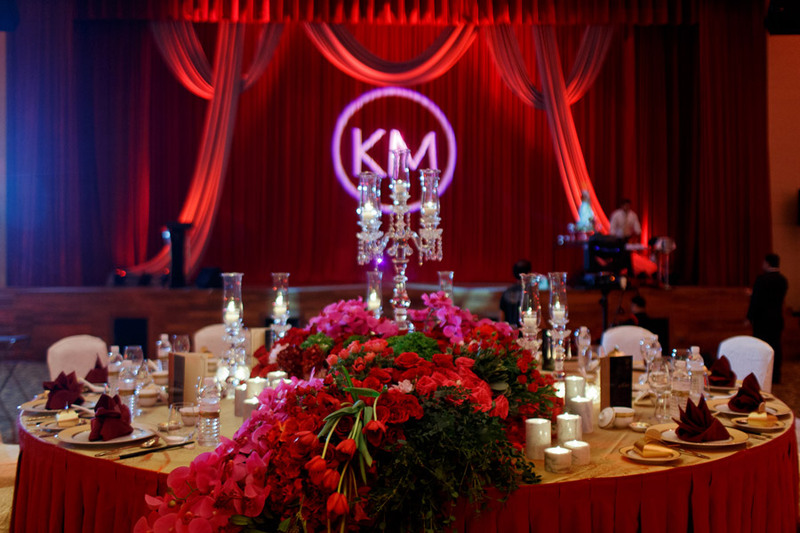 The ballroom was ravishing in red and golden hues. The bridal table, with the stage in the background. 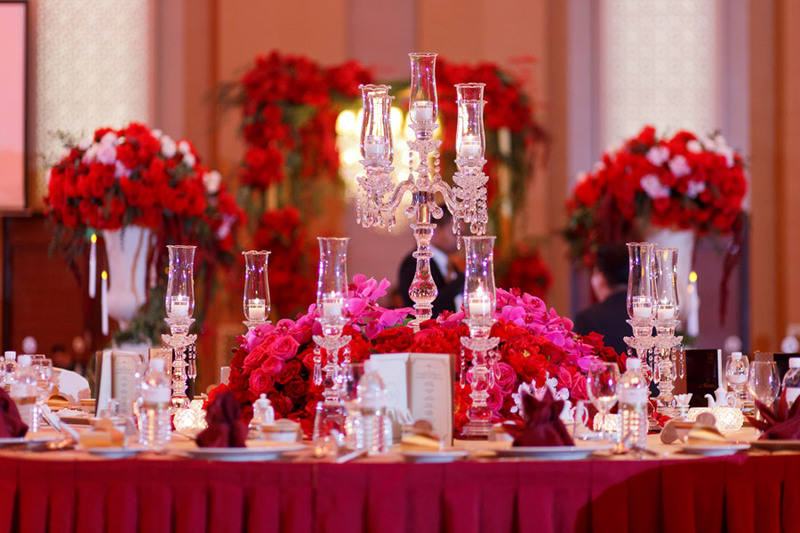 The bridal table’s centrepiece lushly cascades to the ground. View of the bridal table facing the breathtaking customised aisle. 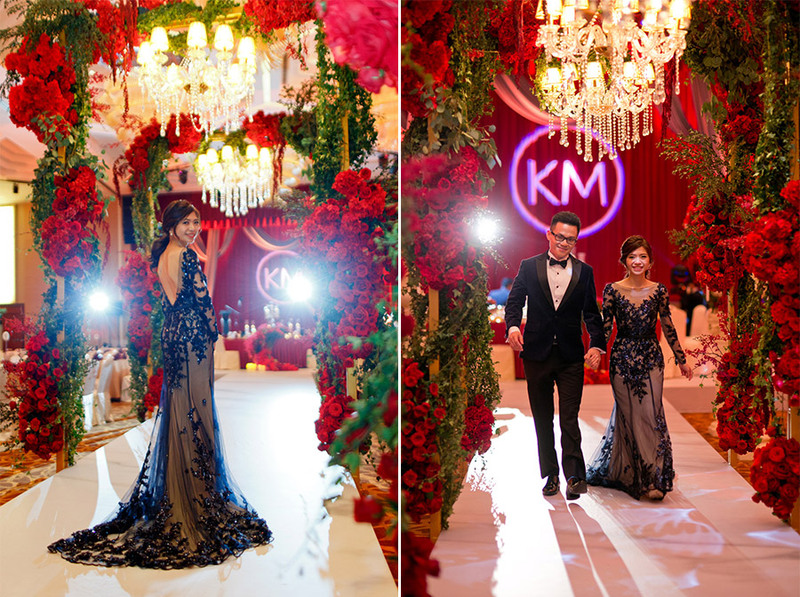 Kee and Mei make their entrance through the amazing aisle. The marble elevated aisle was an inspired addition to the decor. The marble aisle was an idea that came in towards the end of the planning, and was the brilliant idea of Tricia’s, inspired by the marble wedding cake that our bride had chosen. Mei changes into her second gorgeous gown for the evening. We’re loving the overhead lighting from the chandeliers! Just the two of them, sharing a tender moment. Kee and Mei in reception area outside the ballroom. 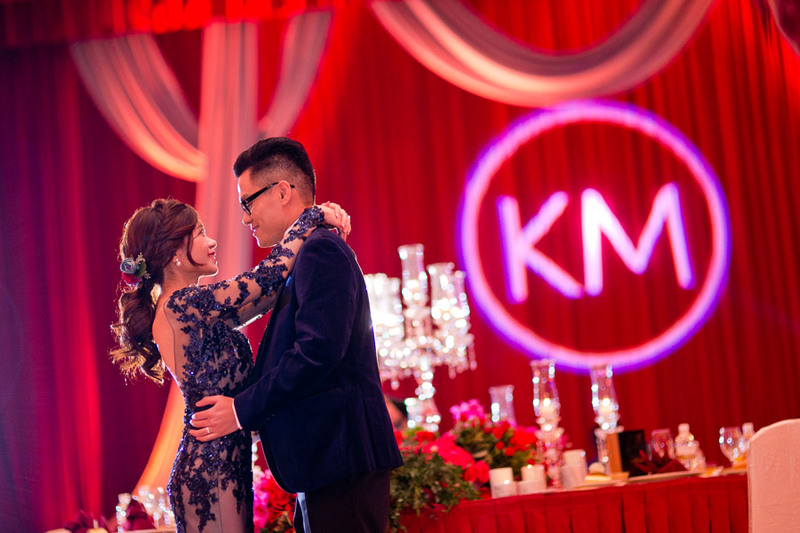 Thank you, dear Kee and Mei, for choosing us to decorate your most treasured day, and for sharing your story with our readers on the blog. 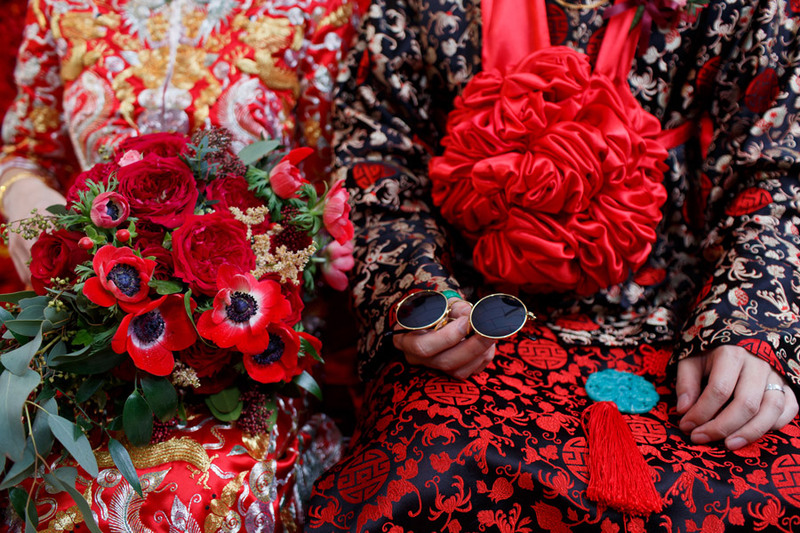 Couples looking for inspiration for their Chinese/red/Oriental wedding can rest assured that this look can be so versatile and bold without loosing any of the style and personality that befits the bride and the groom.